Admired for its natural resources and distinctive quiet area, Donner Summit neighborhoods, including Soda Springs, Norden, Kingvale and Serene Lakes provides easy access to meadows, trails, paths, campgrounds, all season resorts, and recreational activities. Located just off Interstate 80, 10 miles west of Truckee, Donner Summit is also home to five local ski resorts including Sugar Bowl, a training resort for Winter Olympic athletes, and Royal Gorge which is one of the larges cross country ski areas in the country. Known as the “Sierra’s best kept secret”, the Donner Summit area offers all of the beauty of the high Sierra, where wildflowers bloom along endless miles of trails past backcountry streams and lakes. Opportunities abound for camping, hiking, backpacking and mountain biking. Residents love Donner Summit and Serene Lakes real estate for quick access to fishing, swimming and relaxing with a picnic in the sunshine. But with over 20 feet of snowfall each year, skiing is the major draw. 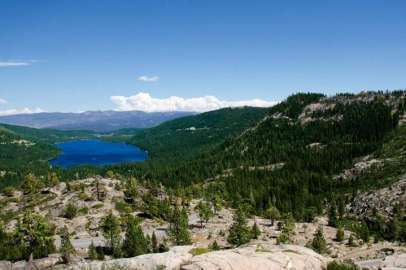 Donner Summit offers a mix of year-round and second home opportunities. This scenic area of 2,400 acres showcases lake-view homes and lots.